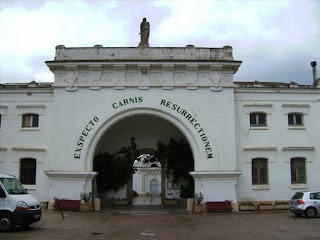 The cemetery of Vilanova i la Geltrú was built in 1855. We can mainly find modernist graves like the one of the bishop of Armanyá. As it happened in other towns, most of the panteons belong to the people who emigrated to America looking for fortune. Some of these graves were projected by known scriptors, and architects such as Bonaventura Pollés or Domenech Estapá. In this cemetery there are also buried famous artist of the time such as Victor Balaguer, manel de Cabanyes, Joan Milá…. Monday to Saturday from 9am to 1am and from 3pm to 6pm. Sundays and holidays: from 9am to 2pm. Monday to Saturday from 9am to 1pm and from 4pm to 7pm. Sundays and holidays from 9am to 2pm. Monday to Friday from 9am to 8pm. Oglejte si Cemetery of Vilanova i la Geltrú (Vilanova i la Geltrú, Spain) na večjem zemljevidu.